Apparently, a lot of new people have joined our little campfire. I’d like to say “Welcome!” Come have a seat! 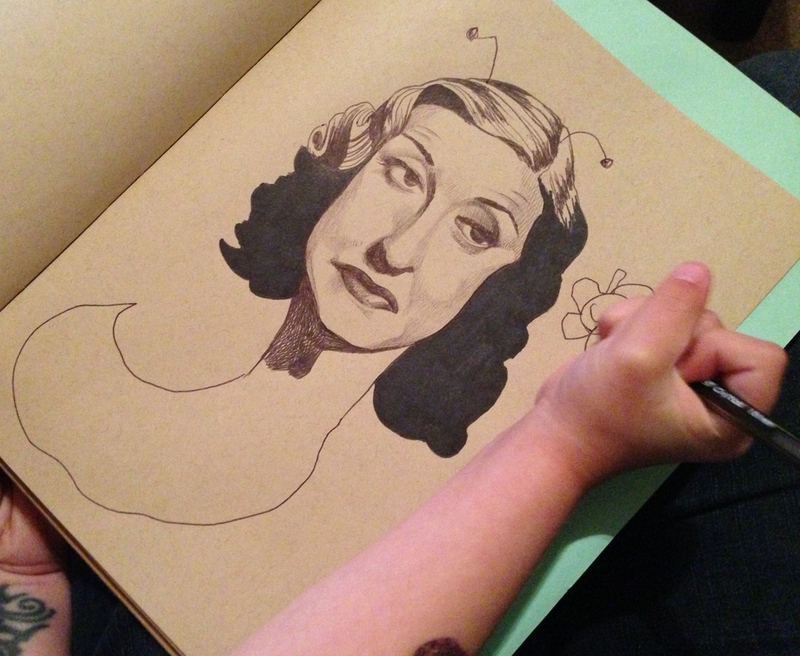 I’ve been getting a ton of new questions about how the kid & I doodle our little doodles. I’ll start off by saying this didn’t begin intentionally. I didn’t plan this out. As I described in the post, my “art life” was very separate from my “mom life,” and that’s how I thought it had to be. When our daughter first hovered over my sketchbook & asked to draw on one of my drawings, it was a lesson in letting go for me, and allowing her to be a part of something I have always been very passionate about. But based on the comments I get on external blogs (probably because they don’t always link back to my original post, which describes the experience), I think some people misunderstand the process. Or maybe they don’t. In any case, I thought it’d be fun to walk you all through one of the pieces we did. Maybe it’ll give you some ideas to doing it yourself! First off, I love drawing from old black & white movie stills. For some reason, the far-off looks, the black & white imagery–I don’t know why, but I could draw those all day. I like playing with the shapes, changing them a little, slightly altering them, and sort of abstracting the shading a bit. 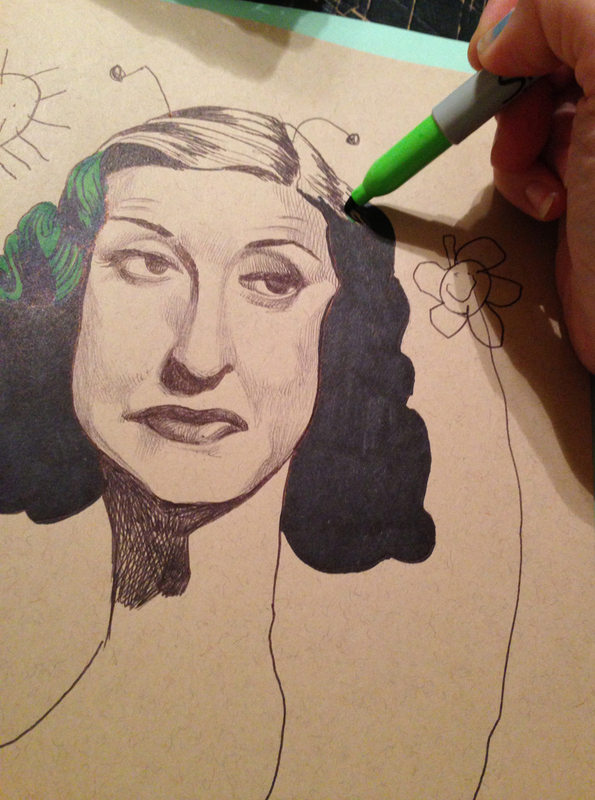 I work in ballpoint pen (because I love it, and I’ve used it over the years and years and years). 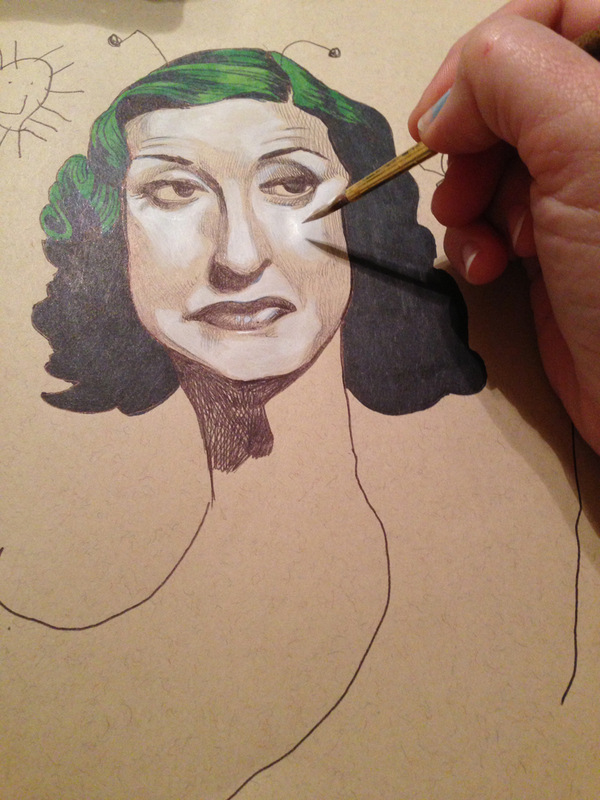 This time, I worked from a picture of Bette Davis. Probably this one. I’m always curious what she’s going to draw. I can give her ideas, but she usually will decide what it’s going to be AS she’s drawing it. This was quite nerve-wracking for me in the beginning. It was HARD to let someone take something you worked on into a completely different direction. Did I always handle it with grace? No. When she drew lines across the faces of some of them, I silently clenched my teeth, did a mental gasp, and squinted my eyes. But you know what? It all turns out fine in the end. For this one, she drew this funky crescent-shaped body, and said, “She’s a slug.” Um. Okay. You turned her into a SLUG?! Some of the ones we had done were easy to collaborate on…a dinosaur, a bird, a dragon. But a SLUG? I kept any judgement to myself, and instead, decided to laugh with her about the lady with the slug body. Thankfully, I’m always up for a challenge. And over time, doing these doodles with our daughter, I often think of my part as translating her ideas to make sense to grownups. It’s a fun challenge to try to figure out a way to make her kid-doodle potentially exist in a 2-D environment. For those curious as to who did what, the basic idea is always hers. She did the body, the antennae, the flower, and the sunshine on this one. Nowadays, she even gives me guidelines: “Don’t forget, mama–her wings should be BLUE.” Or, “That’s not a cracker, she’s holding BREAD. Could you please make sure you color it to look like bread?” In the end, we’re both always pretty surprised at the result. So after she decides what it’s going to be and does her doodles, I do my part. I color in with markers (sometimes she helps). I used to use plain ol’ Sharpies for base color, until Jerry’s Artarama sent me a HUGE box set of my favorite Prismacolor brush-tips. (big shout out to Jerry’s! Woohoo!) So these days, when I get to this step, I use those instead, and I love love LOVE the color blending you can get with them. I add some white highlights with acrylic paint or sometimes watercolor. A little more acrylic for the background. I added a little hopscotch grid to sort of put her in some sort of context. I don’t know why, it just felt right. And because plain ol’ grass gets boring. I did a little fine-tuning to bring the lines back with ballpoint pen. Often, I go back over the lines she and I both already made, to bring them out a little more. And there you go! I called it “Slugs Need Hugs.” One time, playing outside, my daughter said it would be hard to try to give a slug a hug. When I finished this one, I felt a little bad for the little slug lady, trying to play hopscotch, while most likely being unable to perform the required “hopping.” She seemed in need of a hug. 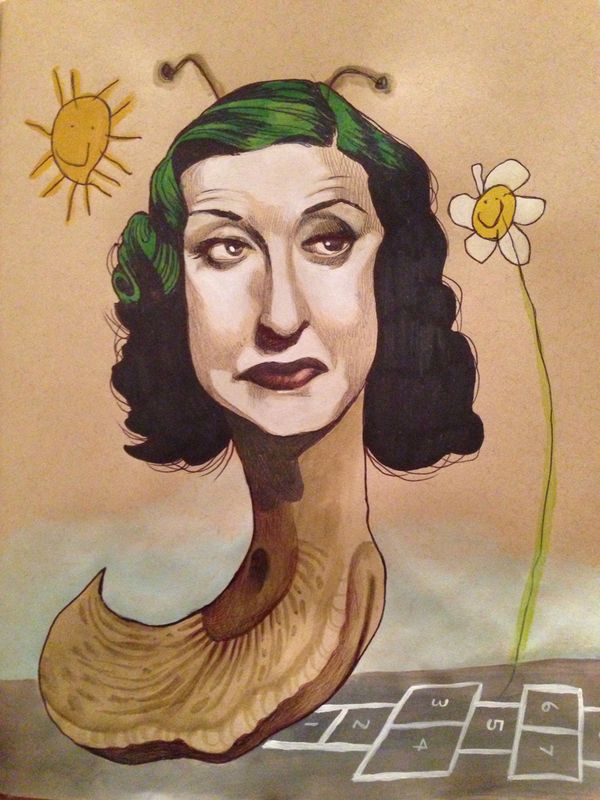 As for any meaning or symbolism in using Bette Davis and then drawing a slug? There is none. AT ALL. I just like to draw faces. 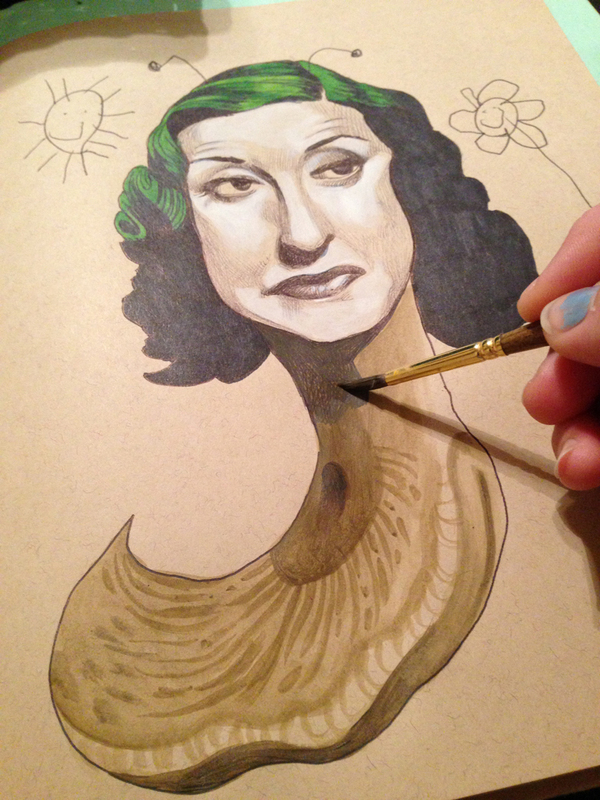 She just felt like drawing a slug. I usually alter them enough that I don’t always remember who they started out as. As for my daughter’s drawing skills? I understand that I’m her mother and I while I can see all the beautiful, wonderful magic in the way she draws (and while her teachers have commented on how focused and detailed she is at drawing), I am the first to admit that maybe her drawings themselves aren’t particularly masterful. But, you know?–for that matter, neither are mine. Anyone focusing on that aspect is sort of missing the point. So what IS the point? To me, it’s about enjoying the experience more than the end result. It’s about combining the “internal” life of an artist with the “external” life of a parent. It’s about helping your kids express themselves without limitations. It’s about sharing your passion with someone else. It’s about taking that thing you love and placing it in someone else’s hands, and trusting that everything will be okay. I skimmed through this post. I apologize for not giving it more time. I will come back later. However, that last line was spot on! It is amazing to let go and let God. The creative and all others things are never done alone. We so need each other. God bless you and your daughter and this wonderful way you have found to share. May it continue as she grows. Hi there, a friend of mine just told me about your drawings with your daughter and I really enjoyed them. Do you sell any? I loved the alphabet with the letters, it was very creative (as is everything). Thank you for sharing your beautiful work. I don’t think any adult can ever recreate a smiling sun like a child does. Love it! Hi there! Thanks so much, I really appreciate it and am so glad you enjoy them! The animals are available at Redbubble: http://www.redbubble.com/people/busymockingbird/collections/244108-abc-animals and the prints are on Society6.com/micaangela. love the doodles with your daughter, and love your step by step explanation! so glad i found your blog!! Ohhhhh, big blush! Thank you so much! I also have a random collection of interests on the ol’ blog. Fun! it! Waiting on a flamingo (wink, wink!) . . . just sayin’!!! Wonderful! You know, we did try one (was it you that suggested it?) and she went a little scribble with it. She loves flamingoes so maybe we’ll try it again! lesson and then watch them create, but I have never taught my own son, I think I get more out of watching his creative process. I always suggest every artist or art student take the time to watch a child create without research, reference or planning. It’s a great lesson in letting go. Thank you for the wonderful inspiration for the day! Thank you so much! Any time I’ve tried to “teach” my daughter, she resists, or listens for a moment, then takes over. What works best is if she’s drawing something and I say, “you know another way you could make animal paws?” And show her. Later on, even if it didn’t seem like she listened, I’ll see it incorporated into her work. Best of luck to yoi! I am so excited and feel exactly that way about providing a place for people to share in creativity! And what better way to enjoy it than TOGETHER! As a community. That’s so wonderful–sounds like you’re doing something you passionately love! I continue to be fascinated by your story…the combined creativity, your willingness to surrender and release to “whatever”, the loving way you encourage your daughter to create. Bravo! Thank you; I’m glad you enjoyed it & hope you can find a way to share the things YOU love in your life! Thank you! My daughter always inspires me in new ways. I LOVE that you do this with your daughter. I just love it! This post is so familar with me. I started collabing with a good artist-friend years ago and at first, it is so difficult to “let yrself GO to the PROCESS” as I call it. Now, I LOVE collaborative art. Kinda both familiar and alien and the meetingspace all rolled into one. It’s exciting to me (been drawing so long, often need to be shook from my “little corner” ) to get a different viewpoint. Kids are great at it and I’ve been lucky enough to collab with a few grown-up children artists. Love the works. Blessings! You know what? I love the collaboration aspect! I’ve led creative projects at church (usually some kind of textile work), where I set out with a clear idea of what I want to achieve as and end result. I found that when I surrendered and worked with what I was given by the participants, rather than what I wanted, the end result was SO much better than the sum of its parts. Someone on Facebook shared you and your daughters collaborations ~ said how brilliant they are and that’s how I found you. They are, indeed, brilliant! All of them. I especially like the animals ~ so very wonderful! I noticed that they aren’t in your shop ~ will they ever be? Thank you! I did a special blog post on the animals, and released them seperately on Red Bubble (http://www.redbubble.com/people/busymockingbird/collections/244108-abc-animals), mainly because they offered options for children’s clothing. I hope you like them! I just discovered your blog and I loved reading this! It brought back a lot of lovely memories … I’m a gramma now, and my 20-month-old granddaughter is also named Myla, and she loves to “make art with Mimi.” When my daughter was born, I was running my own art school. I taught my classes with her in a front carrier, with her little eyes peeking out at me as I did my critiques of students’ work. (I always nursed her on the right side before class, so I could nurse her on the left as I continued to demo drawings with my right hand during class, LOL. It was several months before anyone in the class even noticed she was nursing during class.) When she got too big for the carrier, I put a playpen in the art classroom and she was fine with that for quite a few months, she just played with toys as she watched me teach. (It was the only time I used a playpen for her. In my art studio, I put my chair and easel in the playpen.) Later I taught art classes for moms & kids together…this was kind of innovative in the late 1970s. And as you can probably guess, I didn’t really teach art – mainly I was teaching the parents not to damage their kids too badly while they were being creative! At first I offered one project for the parent-child couple to work on together, (like a sculpture project) but I discovered that by letting the parent have their own project to work on, they let their poor kids alone – which was great because the kids were just fine creating on their own! And the parents really just concentrated on healing their own wounded inner creative child as they had a good excuse to have fun making art…something they never would have done without bringing their child along. I ended up writing a little book about the process, which my daughter and I illustrated (we did separate illustrations though… it never occurred to me to collaborate in the interwoven way that you are doing, which is SO brilliant, I just love it!) Thanks for the inspiration with this blog, I can’t wait to come back and read more…but now I have to get ready to do art with my Myla today! Beautiful stories! And amazing that you have another Myla (I thought I sort of made that name up, as a combination of a couple of names I liked!). Sounds like you’ve discovered what I learned well before I did. I always thought they should have more parent groups where the kids could socialize while the parents did their crafts or arts to be around other creative people. I sorely missed that as a new mama. Sounds like you’ve had a handle on that for a long time! Take care & keep creating with your Myla! Thank you for sharing your generous and adventurous parenting with the world. I have a ‘world’ that I thought would remain mine after becoming a mom but it’s become richer and more satisfying by letting my kids mess it up a bit. My four-old-year did all the work to make an apple pie a few days ago – best pie ever! And honestly, if I didn’t know the back story on these pieces, I would still adore the art. Wonderful! This is a wonderful thing you are doing with your daughter. You are building lasting memories and a better relationship for both of you. Absolutely love your blog and your work! It made me wish I had a little daughter to share with. 🙂 But even for those of us without a talented little collaborator :-), this was an inspiring reminder of the ever present need to “let go” in our creative process. Thank you and your daughter for sharing your creativity. What a great relationship you both must have! Thankyou! Mommyhood isn’t all sunshine & roses, but this has definitely been a bonding thing. Thankyou! Ohmygosh. I LOVE everything here!! 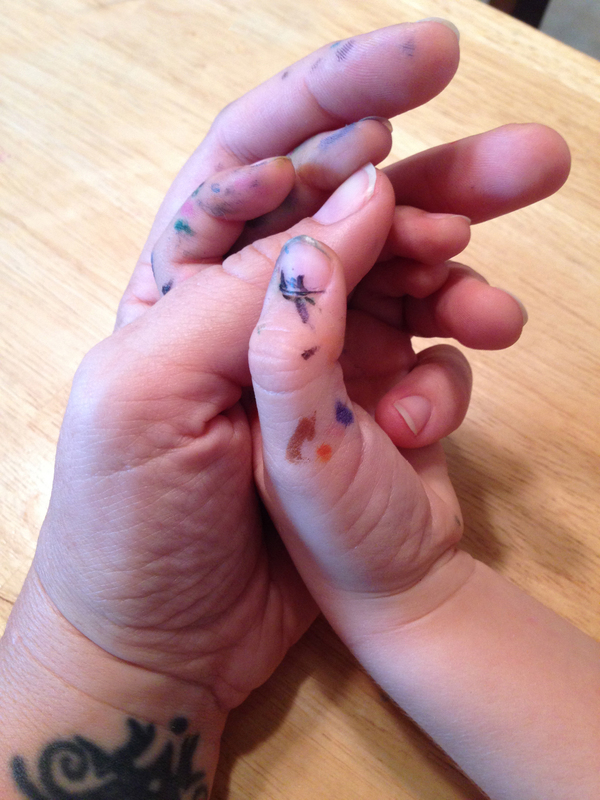 Your artwork, letting your daughter join in, the final product, your writing. I just read about 10 posts in one sitting. I’m the same way with letting my little almost-4-yr-old guy into parts of my life that I want to keep nice – the cringe and close one eye thing. I love that you let go and gave her that piece of you. I definitely need to learn that! And really, the pictures are the coolest mix of crazy talented and whimsical. Seriously love it. Personally I think your daughter gave you the best idea ever. There’s something about mixing the imagination of an adult with a kid and the coloring is just icing on the cake. Thankyou so much! She DOES have the best ideas! Love you and your daughter’s story. Would make a wonderful children’s book! Thank you! I’d love it to be, too! I have been so inspired by your collaborations with your daughter. It’s hard to put words on the liberation these paintings make me feel. I would love to buy some prints, to be honest quite a few, to have at home as a reminder and as inspiration. I have heard many negative things about society6 and before I spend the money would so love to know that the quality is ok. Would you mind photographing the print you have and post it here? Just for me (and the rest of us wanting to buy) to see what it looks like and to still my heart a little. I am so anxious to have these on my wall, but it feels risky to order without having seen at all what they look like. Thank you for sharing this with all of us! Such beautiful work, inside and out! Oh thank you so much! I’m sure there’s always something negative to be said about any business…I can’t post a pic on the comments here, but I ordered one before I even made the post because I wanted to be sure the quality was good, and I was personally very happy with it! It came in a rolled tube and the paper was VERY thick, fine art-quality paper. Not a smooth glossy finish, but more like nice thick art paper. I’m not sure what you’re hoping for, but as a picky artist, I was very pleased with them. Maybe you could order a small one first & see if it’s what you’re expecting? Thank you! I saw your story and loved it. I have always had a connection with drawing with my daughter even though I don’t live in the same state as her because of a divorce. She is 13 now and not so little but this story made me think back to the times she asked to draw with her and I didn’t feel like it or was too busy. This story inspired me to never “not feel like it” and “to find a way” to not be too busy. Thanks for sharing and I hope both of you keep up the work. It is very creative and full of whimsy that us adults forget about far to easily. So glad I ran across this today! I am so in love with everything about this story. 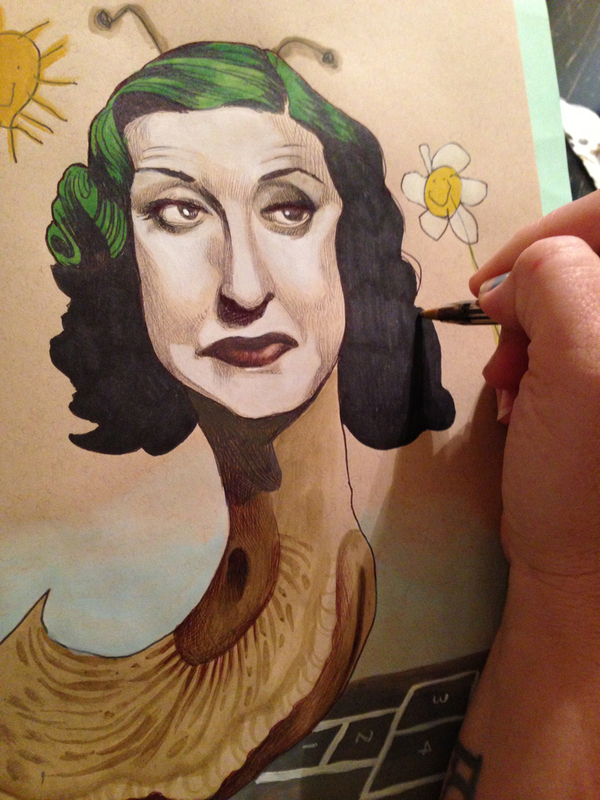 THIS: “I am the first to admit that maybe her drawings themselves aren’t particularly masterful. But, you know?–for that matter, neither are mine. Anyone focusing on that aspect is sort of missing the point.” You are so right! And just the idea that you created these drawings together make them masterpieces. You’re a pretty awesome mom! I have a 16 year old daughter and we are both singers (well, she is way better than I, but I can hold a tune…). Singing together and listening to her perform have taught me so much more than I could have learned on my own. Such a special experience to share your talents with your children! i love all of these! there’s so much accidental magic in what you guys are doing! the fact that you’re open enough to allow a child to (potentially) ruin….not to say she’s ruining them….but regardless….i think its wonderful! i wish my parents would have done something like this with me when i was younger. keep it up, i’m sure it’ll be a fantastic memory for her (and you) when she grows up! much love, don’t stop the magic! Thank you so much! It hasn’t always been easy to let her loose, but it certainly turns out well when I do. I love seeing what she’s done! You know, a slug does seem like a bizarre choice, but this is my favorite. I looked at it for a long, long time when I saw it in the article by Megan McCormick. They are all intriguing and incredibly charming. The slug was very unexpected. I found myself pondering what was going through your child’s head, and how beautiful it was that she chose to exalt that lowly slimy creature. What a beautiful appreciation for the world. I would buy the snot out of these if you produced prints. Just lovely. Thank you so much! Yes, our daughter has always been fond of and never shied away from the sticky slimy bugs or creepy crawly things. Prints are available online at Society6.com/micaangela. Thanks! I love this post! I was an immediate fan and absolutely love the drawings you and your daughter create together. The last paragraph is really what’s it’s all about. That says it all. I’m new to blogging and just created a blog just this summer. My 5 year-old daughter and I did some painting together on vacation in July. I had intended for us to both paint the landscape around us, but she had her own vision. I initially encouraged her to paint the landscape like me, but then realized it wasn’t about what she was painting, but the fact we were painting TOGETHER. I let her create whatever she wanted and she created her own art with it’s own story – HER story – not mine. I painted a small watercolor landscape and she painted an owl! I’m sharing this with you since someone actually wanted to buy that watercolor I painted that day and I used Society 6 to sell a print after I saw how you sold your prints. So thank you for that – You’re a great inspiration! Absolutely amazing! I love the art and I love the collaborative effort behind it. I think it’s a great way to connect with your daughter. More people should do this! A beautiful lesson on letting go and embracing the life you have. I checked out the animal doodles and I have to say that you really are a family of artists. Very impressive work.